There is a lot to keep track of when it comes to open access publishing. To help you find your way we’re publishing five blog posts with quick tips for researchers. These will hopefully make the process of publishing your paper with open access a bit easier. We have previously written about how you sign over the rights to your paper with the copyright transfer agreement. This means that the publisher, not you as an author owns the rights to the text, figures, tables, images etc. of your paper. Depending on what the agreement you’ve signed says it can limit how you are allowed to share and use the contents of the article you’ve published. 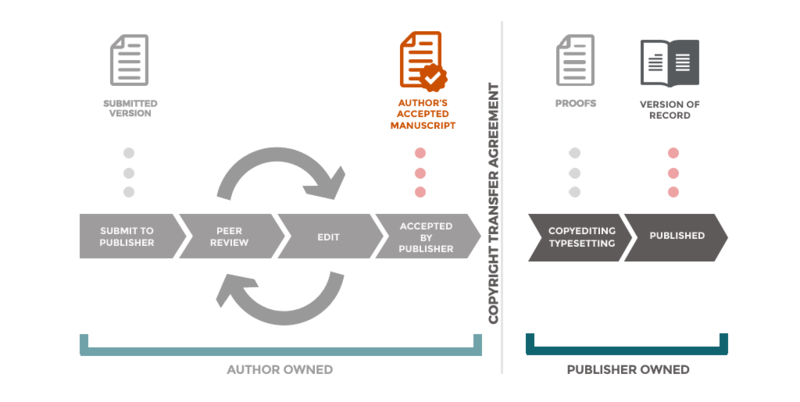 Figure courtesy of the Office of Scholarly Communications, University of Cambridge used under CC BY 4.0. In short: if you have an article your colleagues need for the research you are collaborating on, you can share it. You are allowed to share it privately, e.g. send it by e-mail, hand over a paper copy, or put it in a shared EndNote library. You may share it with colleagues outside of the University of Borås who may not have access to the paper themselves. However, you are not allowed to upload the paper to a public website or social media. The website How Can I Share It is a tool developed by some of the major scientific publishers. It allows you to search for individual articles published by those companies, and will give you lists of examples of where you are allowed to share it. This entry was posted in General by Forskningsrelaterat. Bookmark the permalink.